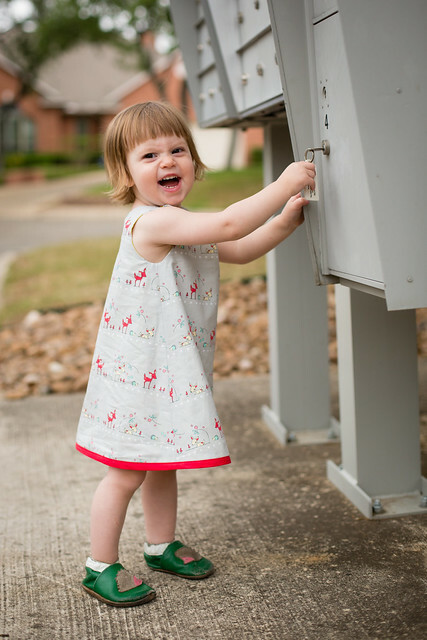 My personal challenge for this spring kids clothes week is to make a dress for each of my three girls. I decided to start with the littlest of our bunch - Iris. 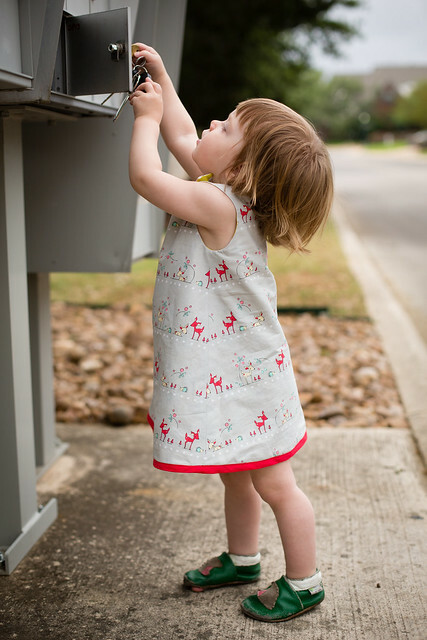 One of the sweetest baby patterns that I own is the Serena Baby dress. The construction is no-fuss. I love that it's reversible. Iris wore this dress a lot: alone, with leggings, with a shirt underneath. It's so versatile and heart-meltingingly cute. It also seemed to fit her forever. And I mean that! It still fits (as a top not a dress). Sometimes the dresses I labor the longest over feel a bit too formal for everyday play. I like that this one is casual. 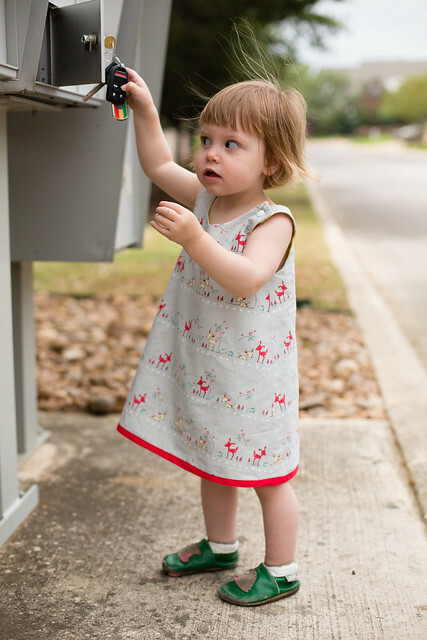 Since the top of the dress still fits Iris well, I decided to lengthen the skirt to create a Serena toddler dress. The dress has a lot of swing, which is adorable, but just right as it is. I didn't want to add to that. 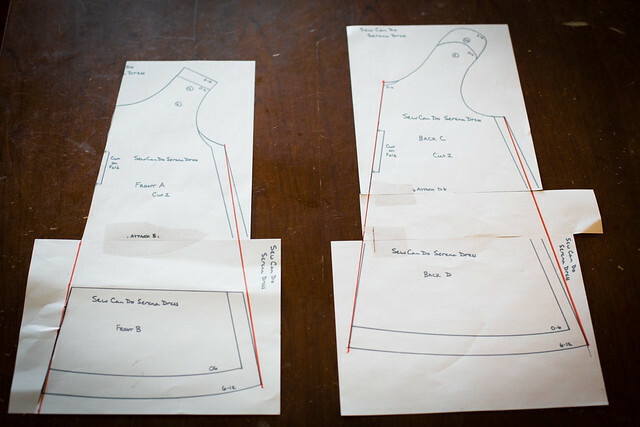 So I lengthened the dress by 2.5" in between where the two pattern pieces join. Then I drew a line from the top underarm point to the bottom edge of the skirt (in orange below). This dress came together fast - in under an hour! I'd highly recommend notching the curves - all of them - to avoid puckering when pressing. I may know from experience after doing a lackadaisical notching job. I try not to gush too much about fabrics because if I gush about everything, it might not mean as much. You know, word inflation. I also don't want my sewing blog to read like a commercial. But I must say that I love (love, love, love) this fabric. I love it! 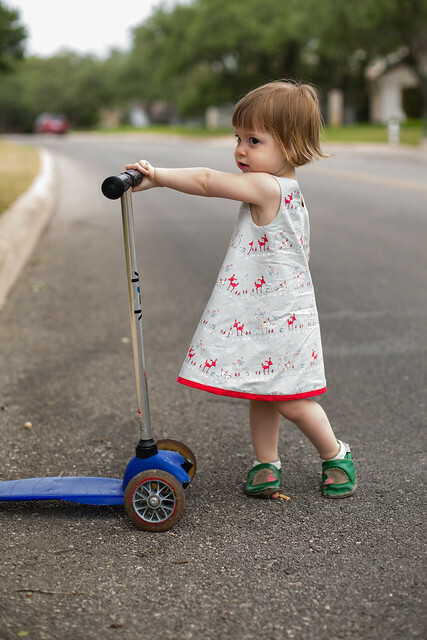 It's lightweight and whimsical and so perfect for little ones. The one thing that's different about this print is the animals run parallel to the selvage edge rather than perpendicular to it. It also means if you want the print to appear upright, you need to place the pattern fold line on the crossgrain rather than on the grain going lengthwise. Generally you want the crossgrain to run across the body, since it has a little more stretch. So even though I broke a few sewing rules cutting the dress this way, it worked. I can't say I even noticed a difference. 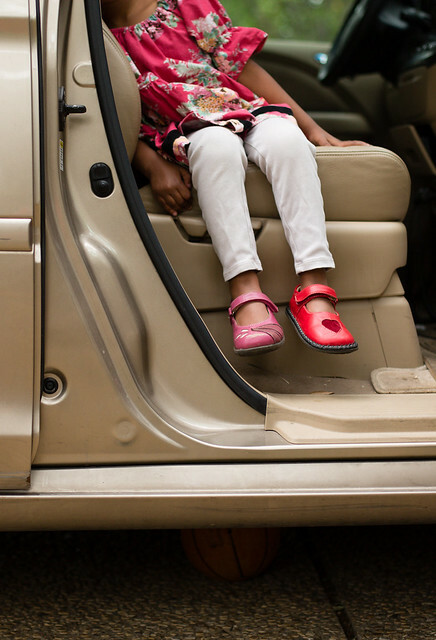 As I was taking photos of Iris in her new dress, I noticed Evie's shoes. Opposite day? Nope, just how she likes to roll. One dress down, two to go. I love that at least one of Evie's shoes is the wrong foot. Awesome. (Pink and red is a great color combo, though - good eye, Evie!). Super cute dress! Sometimes the simplest patterns are the best for everyday wear. Oh cute cute. 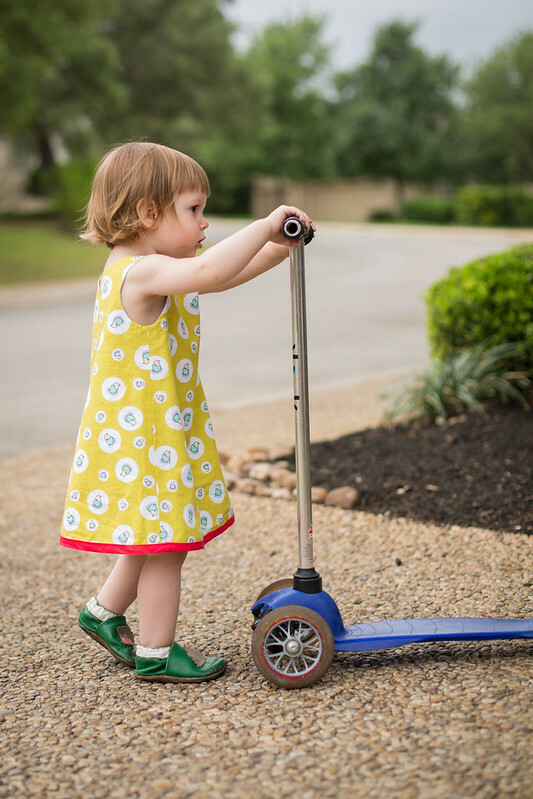 Those fabrics are fabulous - and the dress looks so easy to wear! Word inflation? Best term ever!! Rachel, it looks fabulous! I really love those prints and I really appreciate your kinds words on my pattern. 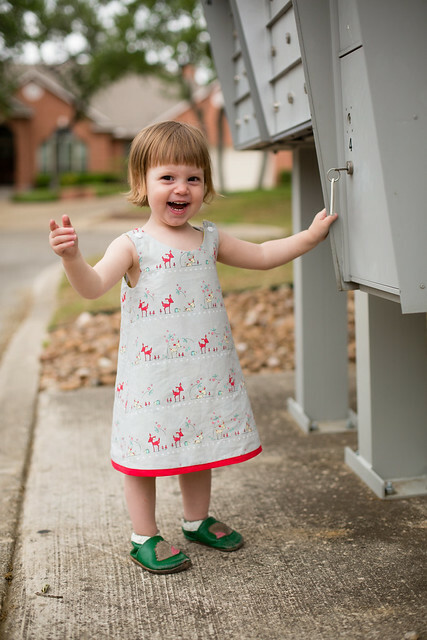 My 3 1/2yr old can still wear the dresses I made for her at 6 months as tops. 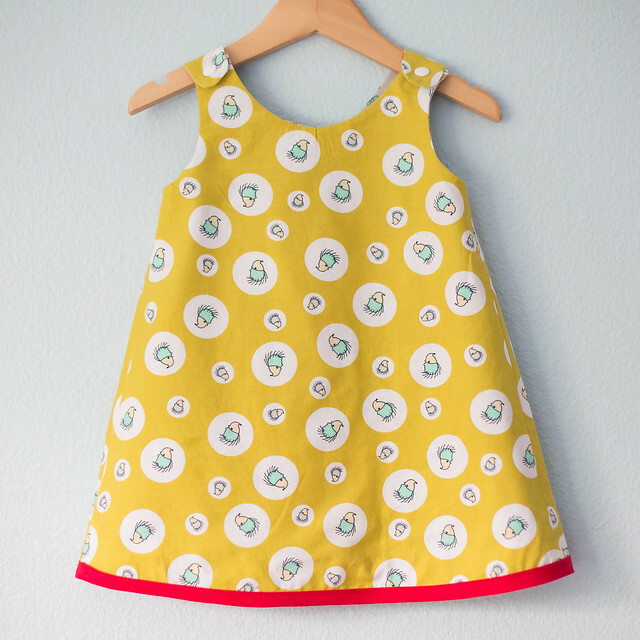 I've made toddler version of the dress with a new reversible button option too, but drafting it into a pdf version is still on my to-do list. Thanks so much for sharing this!! Great start, Rachel! 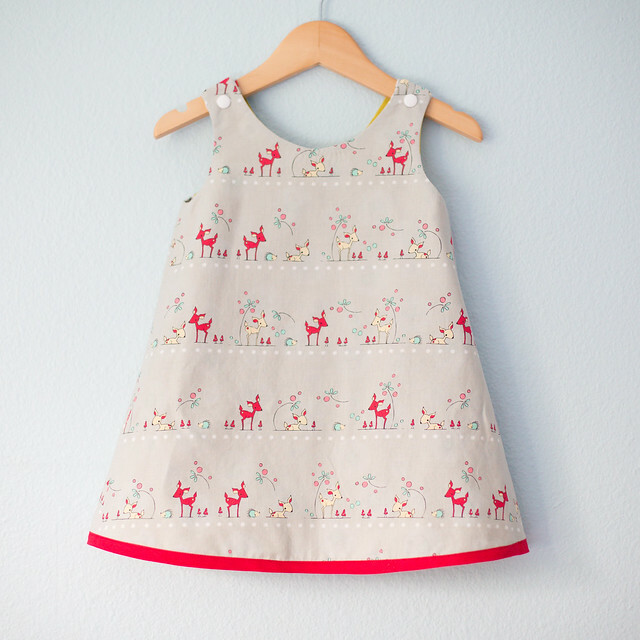 That little deer fabric is precious. Other alternatives were also used. A baby-runner was a padded wooden ring, set at the height of the baby's waist, on a pole that was fixed into the floor and ceiling.